The League of Nations plebiscite for Allenstein was held on July 11, 1920. Allenstein (Olsztyn in Polish) is a city - county that was originally established by the monastic Teutonic Knights in the 14th Century. The word "Allenstein", in German, means "Castle on the Alle River" (now the Lyna River). 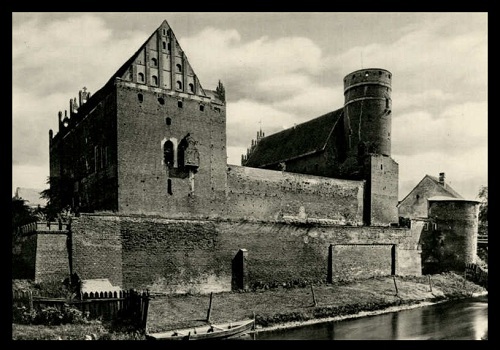 The Teutonic Knights began construction of Ordensburg Castle, shown above, in 1347, and it was completed in 1397. Over the next 400 years, Allenstein changed hands many times between the Teutonic Knights, the Kingdom of Prussia, and the Kingdom of Sweden. In 1772, during the first partition of Poland, Allenstein became part of the Prussian Empire. In 1871, when the German Empire was created, it then became part of the state of East Prussia. After World War I, Allenstein, having both ethnic Polish and German inhabitants, came under the control of the League of Nations. A plebiscite or referendum would then be held to determine whether Allenstein would remain part of German East Prussia or whether it would become part of the new Republic of Poland. In April of 1920, contemporary postage stamps of the Weimar Republic were overprinted in two styles to publicize the upcoming referendum that would determine Allenstein's fate. 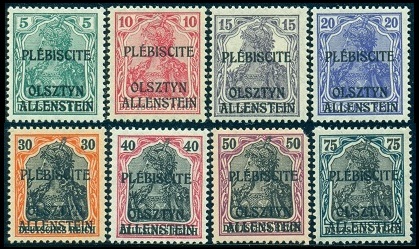 The first type overprint consisted of PLÉBISCITE / OLSZTYN / ALLENSTEIN. They are shown in the images above, with the exception of the 15 Pf. in violet brown, which was issued later on (Mi. #1-14, Sc. #1-14). The second type overprint consisted of an oval with COMMISSION D'ADMINISTRATION ET DE PLÉBISCITE * OLSZTYN * ALLENSTEIN * around the oval and TRAITÉ / DE / VERSAILLES / ART. 94 et 95 inside the oval. They are all shown in the images below, with the exception of the 15 Pf. in violet brown, which was issued later on (Mi. #15-28, Sc. #15-28). These postage stamps were valid for use until August 30. Despite their brief period of use, they are all relatively common in both mint and used condition. 5 Pf. brown, 10 Pf. orange, 20 Pf. green, 30 Pf. blue green, and 40 Pf. (2) carmine Germania definitives were also overprinted, but they were not issued. These un-issued varieties are scarce, but they are not terribly expensive (Mi. #I-VI). The referendum was held on July 11, 1920, and almost 98% of the electorate chose to remain part of East Prussia. 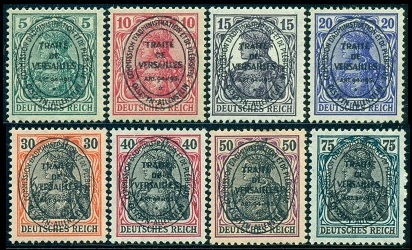 Allenstein became part of the Weimar Republic, and regular German stamps were used there until 1945. After World War II, the former German state of East Prussia became part of the Republic of Poland, and today, Allenstein is known by its Polish name, Olsztyn.